What everyone needs to know about cybersecurity and protecting your information. Tony Campbell has been in Information Security for the last two decades, with the majority of time spent consulting to the UK’s Ministry of Defence. Prior to moving to Perth in 2013, Tony was the Chief Security Architect in a global military infrastructure programme, where he managed a team of enterprise security architects. Since moving to Australia, Tony has provided infosec consultancy services to a variety of state and territory government agencies, as well as authoring a variety of strategic security plans for his customers. Tony works full-time for Kinetic IT, a successful Australian-owned IT managed services provider, where he continues his security consultancy work across their expanding customer base. He is a regular contributor to magazines and online blogs and has recently published Practical Information Security Management through US tech publishing giant, Apress. Tony also holds a seat on the AISA’s committee in Perth where he is an active member. 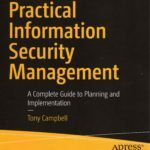 Tony has published several books including his latest “Practical Information Security Management” which he will have available for purchase at the board meeting. What threats are we facing? Who are these masked attackers? This will be an interactive session to discuss ideas and answer questions.